The acreage of the brim is appealing whereas the fashion is more appaling. Straw hats are a pain as they crease and crack so readily and how do you shove it in your backpack. I bought a raffia hat and that is not much better. And I wish I could take photographs like yours! Gorgeous! My day is complete; I was visited by the famous Peter. 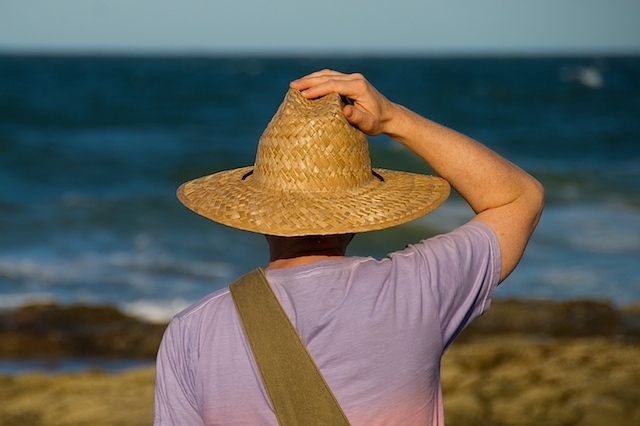 About straw hats: Once they're sat on, they never come back. Love this picture! I thought maybe it was an "Oh my goodness!" gesture, since I can't see the expression-- but you're right, maybe it was just breezy! Olá amigo! Passei para agradecer pela tua visita e o teu comentário. Gostaria se possível, me informasses como me achaste e qual o processo. Fiquei muito feliz e espero que voltes mais vezes, pois será sempre um prazer renovado. Realmente, ter um chapel na cabeça é bom para evitar os raios solares. Só que, a tardinha quando a brisa é forte, necessário se faz segurá-lo com a mão, senão o vento leva. Linda foto! Parabéns! Hats are more necessary now than ever! We have an epidemic of skin cancer in Florida! Still, people sit out in the sun by the ocean for hours on end. What you need is a hat with straps to tie under your chinny-chin-chin! Love the photo - and the hat! You won the competition on Monte Carlo DP, Peter. Send snail mail address pls. Thanks for visiting my blog! Your photos are amazing!! nice and funny shot ! Love the photo; always like photos of people taken from the back! I like it! I need one of those.